Preview what we do each week during the school year! Join us in Hunt 100 will be worship and a word of encouragement from the Bible at 7pm. Afterwards come hangout at our campus ministry house at the edge of campus (312 A Street) at 8:30pm! 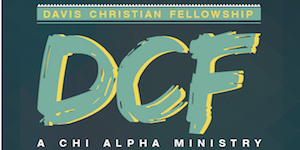 Davis Christian Fellowship is a member of the UC Davis University Religious Council.